OTTAWA - Canada should not limit its new approach to homelessness to only people with mental illness or those who are perpetually on the streets, says a group of top U.S. experts with 10 years of experience in the field. Canada's recent embrace of the "Housing First" principle — helping homeless people put a permanent roof over their heads quickly, no strings attached, no questions asked — will undoubtedly save money and reduce homelessness if implemented wisely, say three pioneers of the approach in the United States. But they said the new strategy should be applied across the board, since it would benefit homeless people of all kinds — not just the subset of those with serious mental health issues or who are frequently on the street or in shelters. "The principle works across more than just the chronic population," said Nan Roman, president of the Washington-based National Alliance to End Homelessness. Roman was accompanied by Barbara Poppe, executive director of the United States Interagency Council on Homelessness, and Mark Johnston of the Office of Community Planning and Development, which falls within the U.S. Department of Housing and Urban Development. They were in Ottawa to meet with senior officials at Human Resources and Skills Development Canada to explain what has gone right and what has gone wrong over the past 10 years of Housing First strategy south of the border. "We are today where the U.S. was 10 years ago, so we have the opportunity to skip ahead," said Tim Richter, the president of the Canadian Alliance to End Homelessness. "We have a huge opportunity to avoid some of the mistakes that were made." In the federal budget, the government surprised anti-poverty advocates by announcing a five-year renewal of funding for the Homelessness Partnering Strategy. At the same time, it also announced that the Housing First principle should be central. It pointed to evidence from a massive pilot project run by the Mental Health Commission of Canada. That project — At Home/Chez Soi — helped find and pay for homes for mentally ill homeless people in five cities across Canada, and then bombarded the recipients with as many social services they needed to stay housed. The project has an 85 per cent success rate so far, matching the U.S. experience. Most homeless people in the project are still living in their first or second apartment one year after the project team intervened. While only preliminary, the project's results are so convincing that Human Resources Minister Diane Finley committed five years of funding to the approach, since she has long been irked by the inability of governments to move beyond "managing" homelessness to actually reducing it, her spokeswoman said. "The evidence shows that the Housing First approach can be implemented across Canada, improves the lives of those who are homeless and have a mental illness; and makes better use of public dollars, especially for those who are high service users," the budget states. 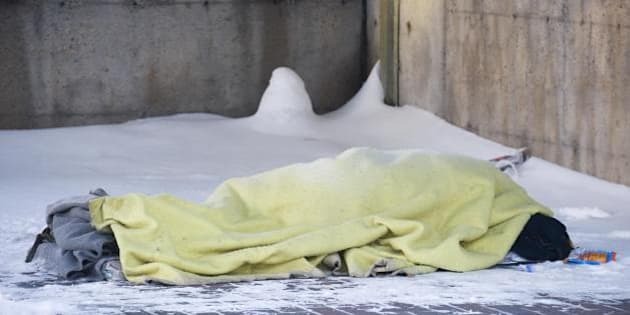 The mental health commission estimates that about 50 per cent of homeless people in Canada have a severe mental illness, with up to 70 per cent dealing with mental health challenges. A study in Toronto found that 71 per cent of people in shelters have a mental illness, an addiction or both. But the benefits of stable housing for families that are homeless for economic reasons are enormous, said Johnston. And if the federal government's new emphasis on Housing First is to appeal to conservatives in Canadian society, he warned, the government would be wise to cast its net widely. "If you're just focused on the chronically homeless, you're going to lose political support." Traditionally in both countries, the emphasis has been on transitional housing, shelters and emergency services, with each community taking its own preferred route. But there was no evidence that any of it was reducing homelessness. The United States turned to Housing First years ago, and many communities in Canada are increasingly inclined to head in that direction. But there has been no federal incentive to do so until now. A federal direction is essential, said Johnston, because it makes sure that communities don't just announce an end to homelessness but also develop a long-term plan to reorient a wide array of social services to support recently housed recipients. By providing incentives, research and expected outcomes, the federal government ensures communities make concrete progress. A bit of competition between communities to see who has the better outcomes doesn't hurt either, said Poppe. "I would say the federal leadership in the U.S. has been key, it's been absolutely key," added Roman. For now, Canada does not have an accurate count of homeless people, nor does it know exactly how each demographic becomes homeless or stays that way. But now that the At Home/Chez Soi five-year study is nearing its end, Canada has iron-clad research that Housing First does work in reducing homelessness and reducing costs, said Cameron Keller, a vice-president at the mental health commission. As the federal government implements Housing First across the country through the Homelessness Partnering Strategy, he expects to see governments use rental subsidies to enable homeless people to choose where they want to live, and then work with experts to figure out what kind of social supports they need to stay there. The concept has been tested on mentally ill homeless people, he said, but he doesn't see why it couldn't be applied more broadly. "I think the concepts, absolutely, are generalizable and applicable."